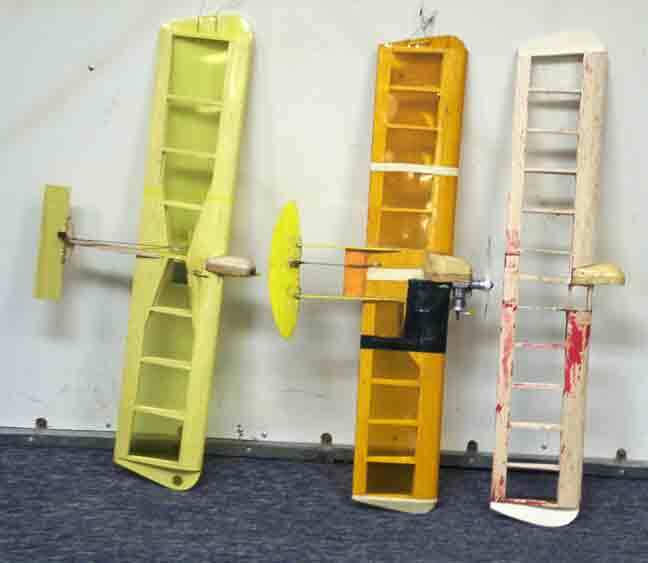 Splinter (left) and Nemeisis airplanes for Vintafge Diesel Combat. All photos by Ken Burdick. D-bat is a confounding event for many reasons that are mostly tied to the engine. One of the issues is lack of power, even on the good ones! What this does is to force the otherwise spoiled N.W combat flier into the old days of antique airplanes that would not over tax the available power. If you attempt to fly an overly large airplane in D-Bat, as I did in 2003 using a scrapper with a 2-1/2 thick airfoil, you will get the following. An airplane that turns very tight maneuvers. An airplane that will slow down lotsa. An airplane that the flingle Bunt will catch up to in a few loops and tear to pieces. It is very hard to beat a well trimmed British D-Bat airplane for the available power of our old time engines. Warlord, Iron Monger Paraná, Dominator and others are the standard models to use. The fun can be in making different models other than the status quo. Some of the more interesting 1970 and before were experiments with high aspect ratio wing designs. Bill Netzband from the U.S. produced the Splinter in 1964 and it apparently cleaned up at the major contests in Europe. The Razor Blade, by Pete tribe, may be the highest aspect ratio wing in it's period. Last but not least by any stretch is the FAI Nemeses. This airplane as most know from its name, was designed by Howard Rush. The airfoil is a bit small for the clunky fuel tanks required in D-Bat but using a larger airfoil fixes that problem. Just past the cut-off of 1970 there are still others such as Tamerlane, and FAI Monoboom, too bad they cannot be used. This still leaves us a few models to choose from, all being smallish in wing area, but longer in span. The Splinter had three versions that ranged in span from 36 to 42 The Razor blade is unknown to me but the 1961 remake of the wing made the span longer and chord narrower. Both the splinter and Razor Blade can be purchased from Barry Baxter plan service. The Fai Nemeses plans would have to obtained from Howard Rush, it is about a 6+ chord with span of about 37 inches. How these wings fly for Northwest Vintage Diesel, is not representative of the designers intent. The reason being is the engines were all much more powerful than our 64 mph speed limit. Bill Netzband was claiming to be close to 100 mph with a diesel! .in 1964! I imagine it was more like a Super Tiger .15 that went that fast. I have actually flown a Splinter built to spec using a Cox Tee Dee .15. It flew great. However, when you bolt on a diesel that weighs about 2 oz more and much less useable power things change. Splinter using a Diesel at 64 mph exhibited wing shifting back and forth indicating the lead out position is too far forward. FAI Nemeses using a diesel at 64 mph flew well but needed lead-outs moved farther back also. A subsequent test flight proved that the Nemeses was quick and stable, tight turning but not as wind friendly as some Brit designs. The challenge for all this is to get them flying well at the slower speed of 64 mph. The Splinter built by Jeff Rein, was corrected and is no longer shifting back and forth in maneuvers. The problem as too much engine offset and leadout position. I built the Nemeses because I wanted to try out a different airfoil on it. I gave Jeff the ribs and he modified them to built the Netzband Splinter. 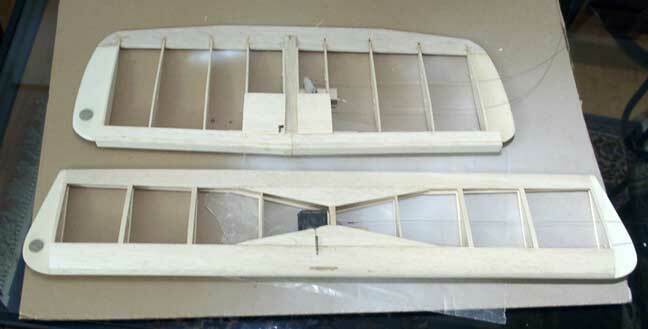 The Nemeses was built to the plans and has a planked leading edge as well as cat strips and a built up trailing edge of 1/16 balsa. Very light wing, covered and all it came in at around 15 oz. Not rugged enough for the event, but was made this way as a reference model. The Splinter was built in a method that will allow the builder to crank them out by the gross and to be strong enough for the event. A solid d-bat leading edge, a 3/8 x 1/4 spruce trailing edge that the ribs are slotted to accept. No spars and very little planking. If we get the Splinter to fly as well as the Nemeses than it's a go. The latest news from the Rein Man is that it flies great now since the engine has been straightened out on the mount. I still maintain that a well trimmed Dominator is the plane to use but no way will it out turn these two. To me, that's the fun in D-Bat, Variety. Dominator (top) and Nemesis wings.